Application:Asucway solar lights is fantastic for lighting.It can be easily mounted either vertically or flatly on staircases, paths, garden, decks, docks and fences. You don't need to do anything because the light itself will turn on at night and off during the day. These LEDs are more durable than conventional glass light bulbs and are more efficient. Specification : Light color: white Bulb Type: LED LED Power: 0.12W Solar panel : monocrystalline silicon,2V/90MA Lumens: 13 LM Switch: Power ON/OFF Light modes: steady on Motion angle and distance:120° 3M Dimension: 5.5 * 4 * 0.7inch Net Weight: 86g Warranty:One Month Refund. Backed by a 100% satisfaction guarantee! Note:This kind of light isn't waterproof,but doesn't affect the use on rainy days. 【HIGH WATERPROOF & ENERGY SAVING OUTDOOR SOLAR LIGHTS】- No electricity charge and it is environmentally friendly.IP65 waterproof can withstand rainy day.No shadow, dizzy light, providing excellent bright light. 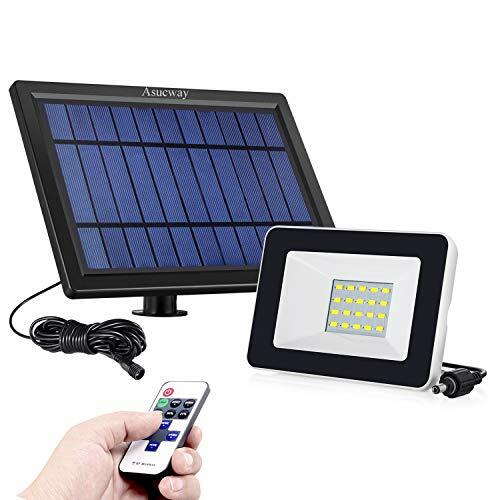 【NUMEROUS APPLICATION OF ASUCWAY SOLAR YARD LIGHTS】- This IR remote control solar lights is suitable for outdoor,such as garden, backyard ,driveway ,patio, lawn ,pathway,and can also be used as street light of village, community,square,park ,school,villa etc. If you have any questions about this product by Asucway, contact us by completing and submitting the form below. If you are looking for a specif part number, please include it with your message.